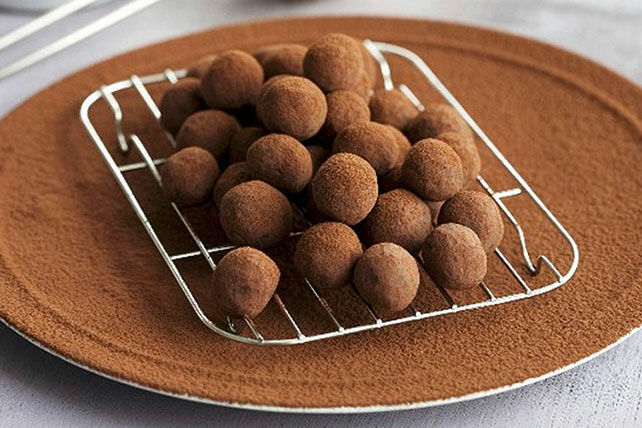 Three little ingredients—cream cheese, semi-sweet chocolate and cocoa powder—are all it takes to make a big hit for your truffle-loving friends. Beat cream cheese in medium bowl with mixer until creamy. Add melted chocolate; mix well. Shape cream cheese mixture into 36 balls, using about 2 tsp. cream cheese mixture for each ball. Roll in cocoa powder until evenly coated. They may be small, but their flavour is big. A serving of 2 truffles is deliciously satisfying. Substitute toasted sweetened flaked coconut for the cocoa powder.